Things I've Loving: Weekend Recap! My son had his 7th birthday recently and I had the intent to use this Party Disco Ball to add some fun to his Minecraft Party Theme. I had 30+ first graders to entertain and in the midst of all the chaos, I didn't get a chance to use the disco ball. But as a family at home, we did have our own special Dance Party where we used it! It was a blast and so much fun. 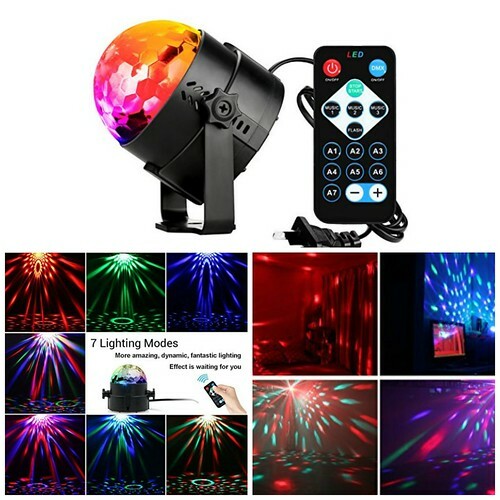 The disco ball offered 7 different lighting settings, making it great for variety and such a colorful way to liven up the room with music blasting. I plan on using this during the summer and out on our backyard deck to continue our dance parties! You can never have too many cutting boards or wooden utensils! 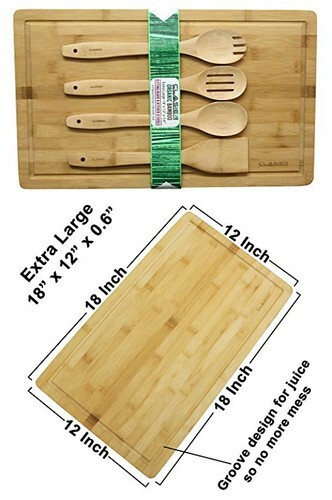 I love this Clasier Organic Bamboo cutting board which came with 4 bamboo utensils. The wood is sturdy and the perfect size for a variety of cutting needs. It fits nicely over my kitchen sink to allow me to wash and chop as I need. It also works well on my stovetop to allow for more counter space as needed. The bamboo utensils are great too and useful. Overall, I love the strength of this wood, which is stronger than others on the market. The additional groove carved into the board makes it easy to use as a carving board to catch any juices. If there's a cutting board I'll reach for first in my kitchen, it's this one! Another kitchen item I can never have too many of are measuring cups and spoons. This Sweet Home & Kitchen Measuring Cups & Spoons set is not only study and colorful, they are accurate too. I love that they are made out of stainless steel with a nice weight and the handles are heat resistant too. 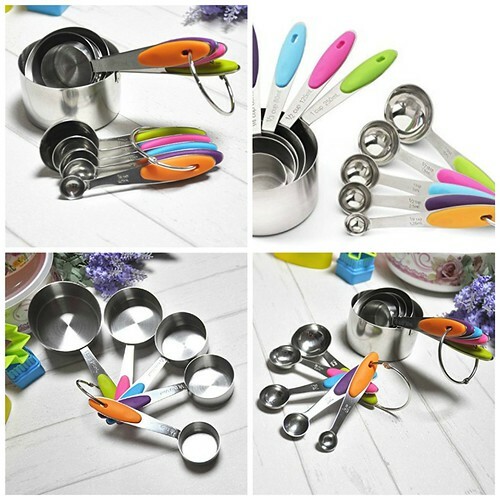 Easy to clean and store, this set is a winner in my kitchen tool collection! Grilling season has already begun in our part of the country (yay!) and I have been looking for some good grilling accessories. One I recently got was this Grill Mat Set by La-Chef. 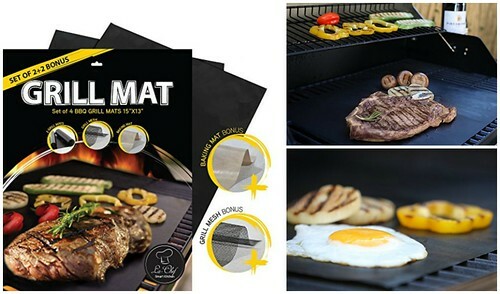 What's awesome about this grill mat set is that it makes the typical grill more versatile in cooking foods you wouldn't think to put on a grill! The set comes with 4 mats - 2 grill mats, 1 mesh mat and 1 baking mat. With these different surfaces to cook on your grill, you can grill pretty much anything. I've made breakfast on the grill using the grill mats to make pancakes, eggs and bacon. The mesh mat was perfect to grill vegetables like peppers, onions, shrimp and asparagus without worrying about them falling through. Overall, I love this set and it makes clean up so easy too. I highly encourage others to consider getting this before grilling season is in full swing! Kitchen shears are a must in my kitchen. I have a pair for specific uses - herbs, poultry, veggies, etc. That said, I have multiple ones and my newest Heavy Duty Kitchen Shears from TianHeng are great! They are stainless steel blades with a micro-serrated edge which are great for various things to cut through. Specifically, one edge is perfect to scale fish, the other blade has a notch to use as a bottle cap opener and the handles come together to use as a nut cracker. I especially like how comfortable and super sharp they are. Included with the shears is a protective case as well. 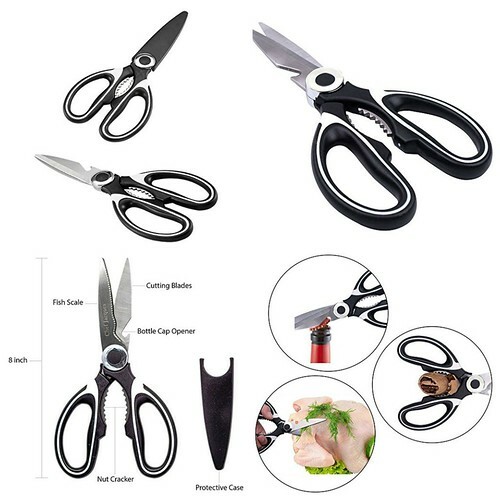 This is my favorite pair of kitchen shears that can do so much! Late last year I greatly decreased my coffee intake and started loving the clean taste of teas. Good teas, I found, didn't require any cream or sugar and were completely flavorful on their own. One particular brand I've always enjoyed was Adagio Teas. They have quite a selection of teas from herbal, greens, blacks, chais, oolong, etc. 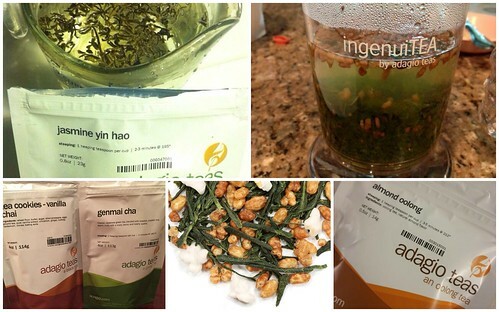 I recently ordered from their website and loved the loose teas I received. One that particularly caught my eye was the Genmai Cha. This is a Japanese green tea that's blended with toasted rice. Together, it makes for a delicious tea with nutty notes. It's not too strong and for me, it's just right. Some other teas I got included the almond oolong, vanilla chai and jasmin yin hao. One thing I also enjoy using when I make tea is the Adagio IngenuiTEA teapot. It really does a good job in allowing loose tea to infuse the water. If you're looking for a good tea, I highly recommend those from Adagio Tea! They've got something for everyone I'm sure you'll find a favorite one as well! Lastly, for those who are avid international travelers need to be prepared to adapt electronically. 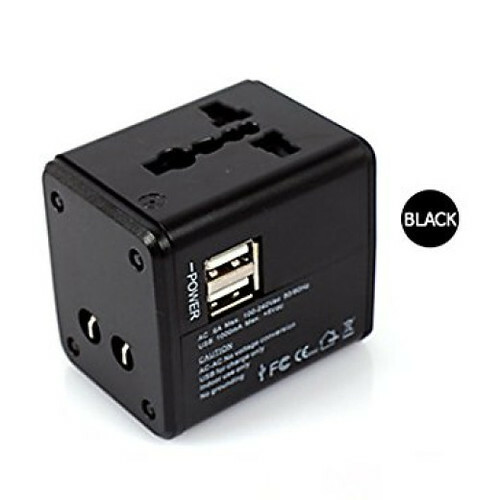 This Travel Adapter from Globaza is ideal to pack along. It works in outlets around the world including United States, Canada, Europe, United Kingdom, the European Union and Australia. Aside from plugging in items like a hair dryer, clothes iron and the like, more importantly, the USB outlets allow you to connect electronically and digitally too! Speaking of travel, my boys have a love of maps. 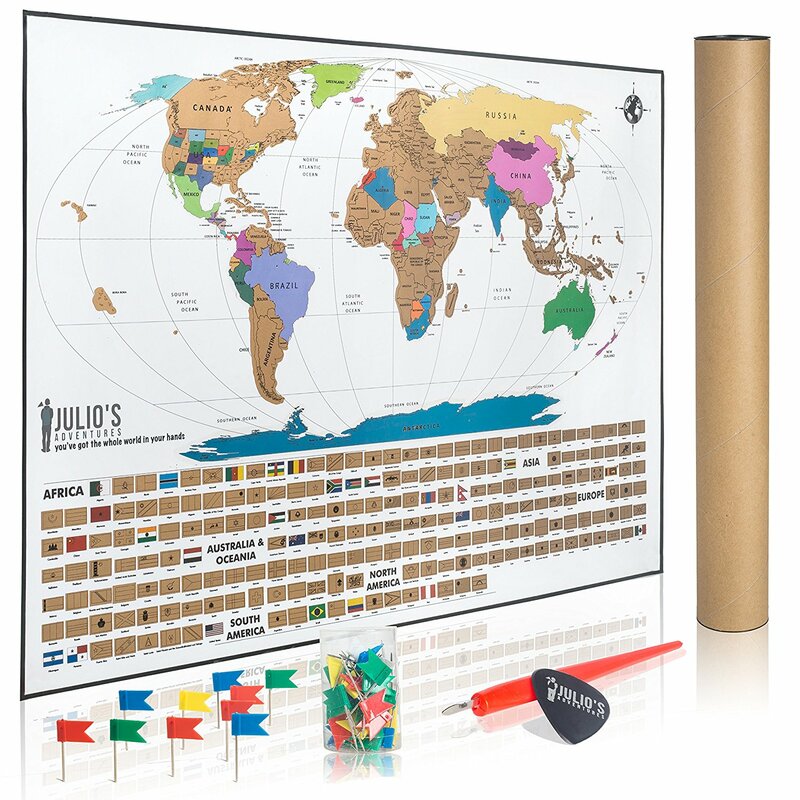 I recently got this Julio's Adventures Map to pinpoint our travels as a fun activity to track! It came with flag pins and it's large enough to mark places easily without having to strain your eyes. The size is roughly 1.5ft by 2 ft, which is great for a child's bedroom wall without taking up too much space. What makes this map unique is that it's made of high quality paper and each country is covered in a gold foil coating. As you visit a country, you can use the enclosed scratching tools to gently rub off the country or state visited, your next vacation or even one you recently learned about. The foil coating is easy to remove, flaking off only when scratched. Bodies of water are kept white and the bottom of the map includes 207 flags from around the world. This map has been great for my little one (who's now 7 years old) and I foresee a lot of time with the up this summer! I've always loved French Pressed coffee over drip. But since I've switched from coffee to tea, I still get a lot of use with my French press because it's perfect for steeping tea. I do this mostly when I intend on enjoying more than a cup and it works with either bags or loose leaf teas! 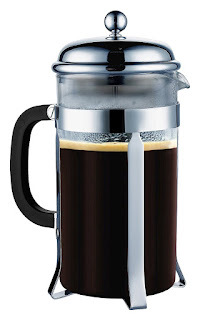 I recently picked up a French press that I use specifically for my teas and I love this one from Coffee Coffee. It's well made, sturdy and has a classic look I love. While we're on the topic of drinking, I just had to share this new wine opener I got. It opens up every cork bottle effortlessly! My previous one broke in the middle of a party I was hosting a few months ago and it definitely set us back from opening up the much needed wine. Now, I can rest easy and enjoy wine with friends with a trusty wine opener. So grab this wine opener, a glass and start pouring! We are about to go camping in a couple weekends and we're not exactly the rugged outdoorsy type. So our version of camping is more like "glamping." To make sleeping in a tent a big more comfortable for us, I got this mattress pad! My husband thought it was silly but honestly, it's awesome and it makes me want to camp, er, glamp, more often! The queen sized matress pad fit perfectly in our 4 person tent. 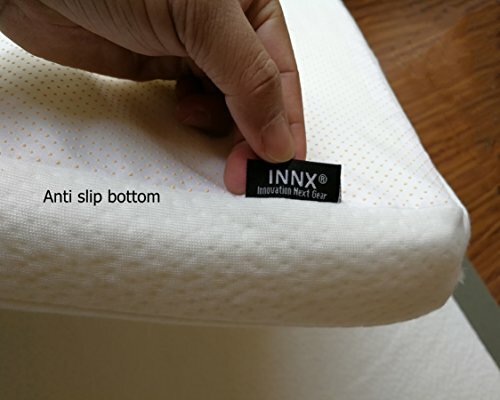 So if you're planning on doing some camping, consider getting a good, thick mattress pad as opposed to a hit or miss inflatable pad or sleeping bags!